You might think that all dried beef would taste the same, but you’d be wrong. I’ve tried quite a few different jerkies now, and this is probably my favorite. (I say probably, because I also think Angelo’s Turkey Jerky is amazing.) The jerky in question is made by a company that specializes in Paleo food, but this grass-fed beef jerky is suitable for all low carb diets. In fact, it’s so good, you don’t need to be on a diet to enjoy it! 1) How soft is it? I hate jerky that I have to dislocate my jaw to enjoy, so a softer (but still chewy) jerky scores higher. This jerky is vacuum packed with a very small amount of marinade, which keeps the jerky slightly moister than most jerkies. 2) How flavorful is it? Although I like the taste of beef, it gets a bit boring, so I like my jerky to be full of other flavors! This jerky is marinated with sea salt, apple juice concentrate, paprika, pineapple juice concentrate, beef powder, black pepper, garlic powder, and ascorbic acid. Don’t be scared about the fruit juice ingredients because they’re in such small amounts that they add in negligible amounts of sugar or carbs per 2.5 oz (71g) serving. The marinade has a bit of a tangy sweet flavor to it. You can also taste the pepper along with a little bit of a kick from the paprika. 3) How carb-free and sugar-free is it? 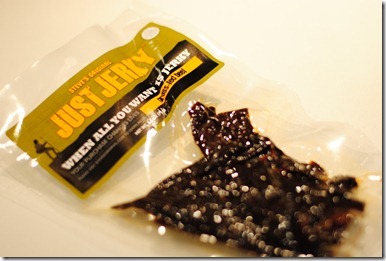 Some jerky taste really good because they’re marinated in a LOT of sugar! This one contains some fruit juices, but overall, its carb and sugar contents are both ZERO (for 1 serving). 4) Other advantages or disadvantages? On the plus-side, it’s made from grass-fed beef, which is slightly healthier and in my opinion, often tastes better than grain-fed beef. On the other hand, it’s a bit messy to eat, because it’s rather juicy and makes your fingers sticky. Where can you buy it? You can buy the grass-fed jerky I from Steve’s Original’s own website. They sell 5 of the 2.5oz packs for $28.75 (i.e. $5.75 per pack). They also have a non-grass-fed jerky, which costs $23.75 for 5 2.5oz packs. Shipping is extra (shipping to New York is $6.62 for UPS Ground 2-7 days, and I expect it might be more to other states since they’re shipping from New Jersey). They also ship to some other countries.